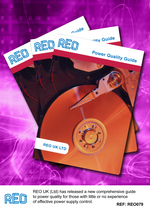 REO UK (Ltd) has released a new comprehensive guide to power quality for those with little or no experience of effective power supply control. The guide highlights the importance of safe and clean power supplies and discusses the problems that can occur. Preventive measures are described to stop power supply problems damaging equipment. REO’s power quality guide outlines some of the power quality problems that can be encountered in environments with high levels of electrical and electronic systems. Radio frequency interference, harmonic pollution, transients or spikes, voltage sags and surges, mains interruptions and blackouts are all typical causes of power supply problems. REO’s guide takes readers through each type of power defect with an explanation of how the problems occur and what preventive measures can be taken to avoid the problem. “Our guide is an essential tool to help identity power quality problems before they get serious. “ said John Symonds, managing director of REO UK Ltd. “Power quality problems can be disruptive, costly and damaging to otherwise reliable equipment. We hope our guide will help plant engineers become more aware of the potential problems that can occur and, in the long run, save money through the use of preventive measures.” He continued.